The Art Gallery of New South Wales is delighted to announce that applications are open for the 2018 Studio in Paris Scholarship. The AGNSW scholarships offer two-month and three-month tenancies in either the Moya Dyring Studio or the Dr Denise Hickey Memorial Studio at the Cité. The Studio in Paris Scholarship is judged by Gallery staff and the deadline for applications is Friday 23 June 2017. Established in memory of Eva Breuer, one of Australia’s most loved and prolific art dealers who made a signification contribution to Australian art in the 1980s and 90s, the scholarship is judged by Gallery staff and a representative of the Breuer Foundation. Elena Papanikolakis, the recipient of the 2016 Eva Breuer Traveling Art Scholarship, is currently living and making work in Paris for three months. Papanikolakis said that being located in the centre of Paris at the Cité Internationale des Arts has been a wonderful experience. “I am incredibly grateful for this opportunity, which has afforded me time and space to intensely focus on my practice and engage with art-making on a new level. “The Cité is a lively community full of artists – so there are plenty of opportunities to meet like-minded people,” Papanikolakis said. 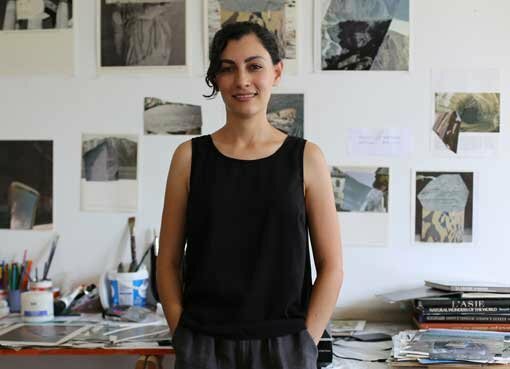 “Being awarded the Eva Breuer Travelling Art Scholarship has had a big impact on my practice, which I’m sure will be felt well into the future. I strongly encourage anyone who is considering applying to do so,” Papanikolakis added. • The successful applicant attends the winner’s announcement at the Art Gallery of NSW in late July 2017. • Finalists will be selected and contacted in late July.